Welcome to Sedona! 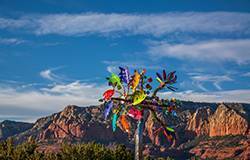 Sedona’s breathtaking natural beauty has become an inspiring haven for artists of every kind. From independent filmmakers, visual artists, performance and music, to theatre and ballet. 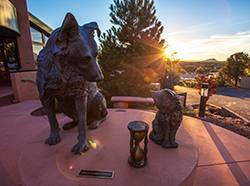 The city of Sedona describes itself as “a city animated by the arts”, and public artworks can be found throughout the city for your enjoyment. The Gallery District is a delightful walk just outside of Uptown and other locations can be reached by a short drive or taking one of two of our Trolley systems. We hope you will visit our art-filled plazas and parks with this map as your guide. Please use WalkSedona.com on your mobile phone for directions. This map is divided into four districts to make it easier for you to explore. This is a partial list of treasures you will find at each location. Enjoy finding an unexpected work of art just around the corner. 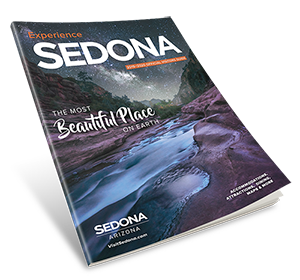 Home to the Verde Valley Medical Center, Sedona Performing Arts Center, City Hall Plaza, Arroyo Pinon Botanical Park and the Sedona Library. It is the Western Gateway into Sedona from SR260/I17 coming from Phoenix. “The Healer” by Joe Beeler, founder of the Cowboy Artists of America, Bronze. Beeler became one of the nation’s most prolific and best-known western artists in the late twentieth century and one of Sedona’s most beloved citizens. “Endurance” by Shirley Thomson-Smith, Patinaed Bronze. Over a 40-year career, sculptor Shirley Thomson Smith has earned national acclaim for her distinctive female figures. She blends Native American, African and Mexican features in celebration of the quiet inner strength of women. “Ruth” by John Waddell, Bronze was modeled after his wife Ruth. “Rising: The Art and Life of John Waddell” on PBS showcased his inspiring story as an artist who resisted modern trends to stay true to the human form. “Of Fears & Dreams: American Priorities revisited” by Nancy Robb Dunst w/the 2014 Class of RRHS, Mixed Media. The priorities chosen were Love, Health, Defense, Education, Environment & Integration. Dunst is the founder of the Sedona Visual Artists Coalition and a strong voice of the art community. 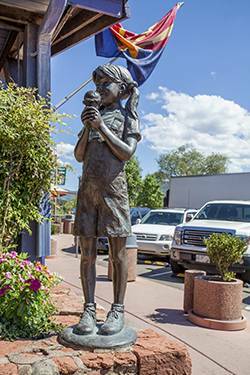 “Sedona Schnebly” Bronze sculpture by Susan Kliewer was commissioned by the City of Sedona. 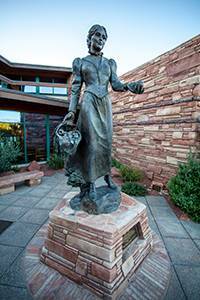 Sedona helped launch Kliewer’s transition from painter to sculptor. “Anasazi Fountain” by John M. Soderberg, Bronze. This sculpture illuminates the transient nature of mankind’s civilization and the immutable durability of natural law. Filled with coffee spots and boutiques, locals do much of their shopping and meet-ups here. You can catch an independent or block-buster film, breakout for an evening of music, bring home a new pet or find your organic food favorites here. “Merlin” by John M. Soderberg, Patinaed Bronze at the Whole Foods Marketplace. Merlin was a most important figure in a chaotic time. He was a unifying force when his people needed unity, and he embodies the magic that was needed to achieve that unity. “Invocation” by John M. Soderberg, Bronze at the Jack Jamesen Memorial Park. The sculpture depicts a Teysha Indian with his arms extended forward in a gesture of receiving the earth’s gifts, in this case a bunch of grapes in one hand, and a gesturing of offering the by-product of wine in the other hand depicted in the vessel of a gourd. 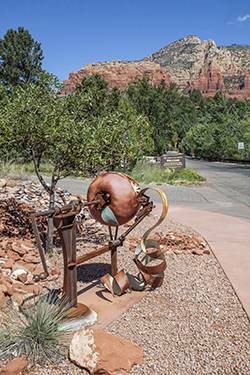 “GlasScape” by Joanne Hiscox, Glass and Metal at the Sedona Rouge Hotel & Spa is one of three outdoor works created by Joanne and Art Hiscox. "Athena's Prayer" which is a tribute to the female soldier, by James Muir, at the Jack Jamesen Memorial Park in Sedona. "Cornerstones of Freedom", by James Muir, also at the Jack Jamesen Memorial Park in Sedona. Come celebrate your inner cowboy or girl in Uptown. It’s a great place to stroll and view local artist works. World-class sculptors and “Javelinas on Parade” are on exhibition here. Spend a day browsing art galleries and delightful shopping plazas showcasing an international-renowned array of artists and artisans. “St. Augustine, Pope Pius X, St. Bonaventure, Samuel, Peter and John the Baptist” This mural was commissioned by Abe and Linn Miller and painted by Eileen Conn, Chapel at Tlaquepaque Arts & Crafts Village. Altar of the Chapel of the Holy Cross, Mixed Media by Marguerite Brunswig Staude, an heiress and artist dreamed of building this chapel completed in 1956. Marguerite built the Madonna sculpture inside and designed the Stations of the Cross and elements of the altar. After you’ve enjoyed all that Sedona offers in Public Art, you may be inspired to take a piece of Sedona home with you. Be sure to visit our more than 80 shops and galleries. You can also partake in the 1st Friday Evening in the Galleries, brought to you by the Sedona Gallery Association. Click here for a full listing arts events.